We started our research by using electronic databases from Pubmed, Web Of Knowledge, VUB- library. As search topics we used “quadriceps muscle contusion” or relevant synonyms. To find more specific information we used targeted terms like “examination muscle contusion”, “healing process quadriceps contusion”. To expand our research for each subdivision we used synonyms of the related subject. Quadriceps contusions are mainly common by contact sports like rugby, football, basket, kick boxing . A systematic review resulted in a frequency from 10% to 40% of all football injuries were categorized as contusion, strains or sprains. The injury is caused by a sudden force to the quadriceps muscle causing significant muscle damage. This force is usual due to another player (in sports), a sport attribute or a misplaced fall on a severe object. The injury consists of a well-defined sequence of events involving microscopic rupture and damage to muscle cells, macroscopic defects in muscle bellies, infiltrative bleeding, and inflammation. The repair of the tissue can be thought of as a race between remodeling and scar formation. If there is major untreated and/or unresolved bleeding deep in the muscle tissue, a serious condition known as myositis ossificans can occur. Contusion injury can lead to either diffuse or circumscribed bleeding that displaces or compresses muscle fibres causing pain and loss of motion. It happens that muscle fibres are torn off by the impact, but typically muscle fibres are not torn by longitudinal distraction. Therefore, contusions are not necessarily accompanied by a structural damage of muscle tissue. For this reason athletes, even with more severe contusions, can often continue playing for a long time, whereas even a smaller indirect structural injury forces the player often to stop at once. Ability to stretch the muscle may be reduced slightly. The strength of the muscle may also be slightly affected. The diagnosis is made by questioning an accurate history from the patient and completing a physical examination. Palpation along the injured muscle: to localize the pain and exact site of muscle damage and also to determine if there is any associated injury. The palpation test involved systematic digital probing from the lateral border of the vastus lateralis to the medial side of the thigh with the patient in long sitting, after which the physiotherapist subjectively noted, then recorded, the muscles injured and the area of injury (distal third, middle third or proximal third of the thigh). Passive knee range of motion testing was performed with the subject in prone, with the hip in neutral, and the foot and distal third of the shank over the edge of the plinth to enable positioning of the Baseline digital inclinometer Prior to performing a joint angle measure, the tester passively flexed both knees three times until the available end of range was reached as determined by the first onset of pain on the injured leg, and restriction on the non-injured leg.This was done as a control for any preconditioning effect. The inclinometer was set to zero on the horizontal surface of the plinth, and placed on the distal end of the tibia to measure joint angle as the tester flexed the knee Subsequently, the difference in flexion range between knees and the relative percentage of knee range retained were determined. The brush-swipe and tap tests were performed with the patient in long sitting. In the first of these, the examiner was required to stroke the medial side of the patella, proximally towards the hip joint, two or three times followed by a stroke down the lateral side of the patella. A positive test was registered when a visible wave of fluid was evident on the medial side of the knee joint and below the patella border .The tap test was performed by applying a slight tap or pressure over the patella. A positive test was present when a large amount of intracapsular swelling produced a floating patella so that, on tapping, a downward movement of the patella could be felt by the tester. Strength testing of the quadriceps: that contains resisting knee extension and hip flexion, compared to the uninjured side. This will help in assessing severity of injury. The ‘Lower Extremity Functional Scale’ is used to evaluate the functionality for a wide range of lower limb conditions to know whether the person is having any difficulty with certain activities. The best techniques for measuring the soft tissue damage and for complications caused by the initial injury are magnetic resonance imaging (MRI) and diagnostic ultrasound. Both have been highly sensitive to oedema and haemorrhage. These methods are expensive but can speed up the healing process by detecting the severity quick. 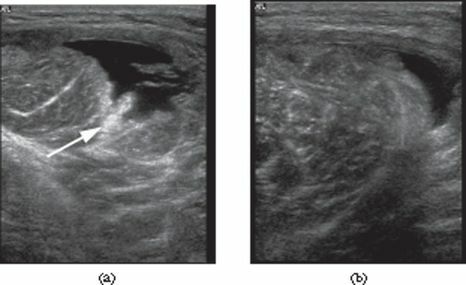 Ultrasound can be used to identify a localized hematoma formation caused from a contusion and provide real-time imaging for needle aspiration. If there is concern for bony involvement, radiographs will evaluate for bony injury. Subsequently, radiographs are useful in identifying heterotopic bone formation, known as myositis ossificans (MO), which is a delayed complication of severe muscle contusions. MRI provides excellent lesion detection and localisation. The images are anatomical and clearly understood by healthcare professionals and patients alike. Depending on the magnet used, even the largest of athletes can be imaged without difficulty. However, MRI is a scarce resource, expensive, time-consuming, uncomfortable and acquires static images. A 32-year-old male professional footballer with a deep surface thigh haematoma. (a) Coronal and (b) axial short tau inversion–recovery MRI of the anterior thigh demonstrating a large haematoma deep to the vastus intermedius muscle (arrowheads) adjacent to the femoral cortex (F). Note the laceration into the muscle (arrow) and the layering of blood products on the axial image (curved arrow). The player was imaged 2 weeks after the original injury and had completed two full games in the interval between the injury and the MRI scan. A 26-year-old male professional footballer with thigh haematoma. (a) Axial sonogram of the anterolateral thigh 2 days following a direct blow to the lateral side. Note the echogenic torn muscle tissue (arrow). (b) Axial sonogram taken 2 weeks later showing filling in of the haematoma. NSAIDs can be useful short term for decreasing pain, but their long-term effect on muscle healing is not known . Long-term use of NSAIDs for contusions is usually not necessary and is discouraged. However, NSAIDs have been promoted for prevention of myositis ossificans after severe quadriceps contusions. Evidence for this use is inferred from studies showing a decrease in heterotopic bone formation after total hip replacement in those patients given indomethacin for at least 7 days. Similar to quadriceps muscle strains, corticosteroids are not recommended in the treatment of contusion injuries. For patients with a quadriceps muscle contusion, there are several treatments from which a physical therapist can choose. The first option is cryokinetics. It is a revalidation technique that consists out of ice application followed by progressive, active exercises. Once the affected thigh is getting numbed, you can begin with passively stretch the leg. A second aspect of the treatment program can be soft tissue massage around the periphery of the contusion. This leads to a better fluid resolution. A third option is electrotherapy in order to reduce the pain. Very important is that the patient avoid activities that excessively load the quadriceps during the physical therapy. The principles of treatment for quadriceps contusions are essentially the same as for quadriceps strains, with one major exception.It is recommended the injured leg be placed in a position of flexion for the first 24 h post-injury to limit hematoma formation. Practically, this can be done by placing the patient in a hinged knee brace at 120° of knee flexion or using elastic compression wrap to maintain this position of flexion. This needs to be done as soon as possible after injury. Rest, ice, compression.Compression is important in order to limit the hemorrhage for the first 24 to 48 hours.If the patient rests with his knee flexed, it helps to avoid muscle stiffness. Active and passive quadriceps muscle stretching with emphasis on knee flexion.After 24 h, the brace or wrap should be removed and gentle, active, pain-free range of motion at the knee should be instituted along with stretching and isometric quadriceps strengthening. The active phase of treatment, including functional rehabilitation, can begin when pain-free, active knee flexion of at least 120° is attained. Improve the functionality and a return to sport when full motion and strength are achieved. Criteria are similar to muscle strains for return to sports in contusions of the quadriceps. The athlete should be pain free, attain 120° of knee flexion with hip extended, and perform all aspects of functional field testing without limitations . Protective thigh padding is recommended prior to resuming sports in order to reduce recurrence. Contusions are one of the most common muscle injuries besides muscle-strains. They can sometimes evolve to a more complicated injury such as myositis ossificans or compartment syndrome, to which you have to pay attention. The options for treatment are mostly physiotherapy and in some serious complications an operation will be needed. Physiotherapy is designed to reduce the pain and improve the ROM of the patients, by giving cryokinetics, soft tissue massage and electrotherapy. ↑ 4.0 4.1 Mueller-Wohlfahrt HW, Haensel L, Mithoefer K, Ekstrand J, English B, McNally S, Orchard J, van Dijk CN, Kerkhoffs GM, Schamasch P, Blottner D. Terminology and classification of muscle injuries in sport: a consensus statement. Br J Sports Med. 2012 Oct 1:bjsports-2012. ↑ 6.0 6.1 Huntoon EA. Essentials of Physical Medicine and Rehabilitation. InMayo Clinic Proceedings 2003 Apr 1 (Vol. 78, No. 4, p. 291). Elsevier. ↑ Quadriceps Contusion (Cork Thigh).Available from https://sma.org.au/resources-advice/injury-fact-sheets/quadriceps-contusion-cork-thigh/. Accessed on 17 August 2018. ↑ Beiner JM, Jokl P. Muscle contusion injury and myositis ossificans traumatica. Clinical Orthopaedics and Related Research (1976-2007). 2002 Oct 1;403:S110-9. ↑ Lee JC, Mitchell AW, Healy JC. 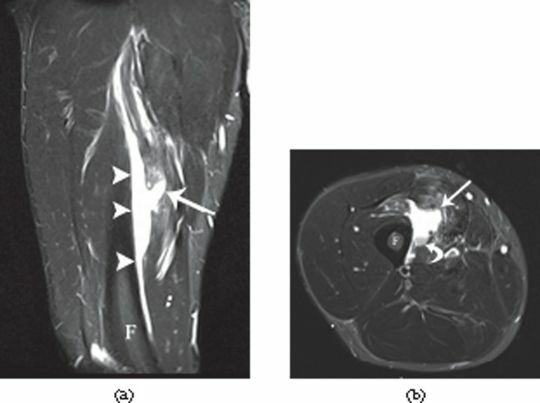 Imaging of muscle injury in the elite athlete. The British journal of radiology. 2012 Aug;85(1016):1173-85.